April 2019: So, so, so happy to share this news. I sold some books! I have news! 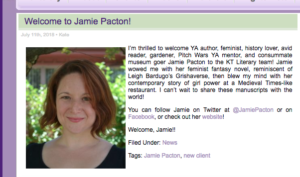 After a year in the query trenches (again), I’m so excited to say that my books have found a fierce champion in the amazing Kate Testerman at KT Literary! I keep re-reading this Welcome Note from KT’s website to convince myself it’s real.